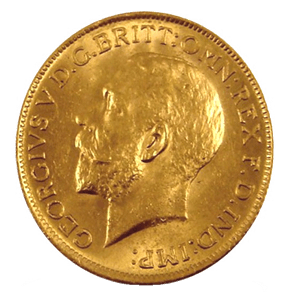 The Gold Swiss 20 Franc represents a fascinating part of history. 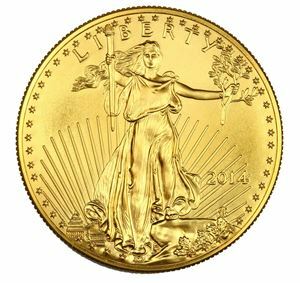 With minting beginning in the late 19th century, these coins have international recognizability and appeal to collectors. They are also considered legal tender and are minted by the Swiss National Mint in Bern, Switzerland. 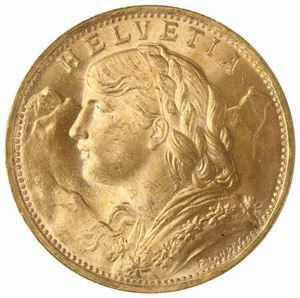 The Swiss have a history of strong hard money standards, and this coin is representative of Swiss independence, fiscal responsibility, and sovereignty. 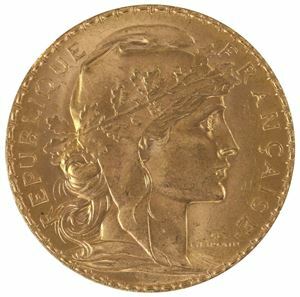 With a composition of 90% gold, you can get the Gold Swiss 20 Franc for a reasonable premium and you get the added benefit of a durable coin alloyed with copper to stand up to usage as a legal tender. The design features the profile of the iconic “Swiss Miss” familiar in Switzerland folklore with the word Helvetia above her flowing, braided hair. Helvetia refers to the female personification of the country Switzerland. On the reverse is the Swiss coat of arms; a detailed shield with a cross emblazoned on it covering bundles of intricate branches and with the date below. 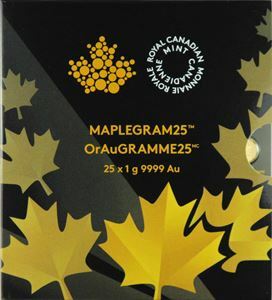 The Gold Swiss 20 Franc is .1867 troy oz and is an excellent choice is you're looking for a smaller gold coin with worldwide recognizability. These coins come in random dates.